The Hong Kong E-Prix race weekend thrilled thousands of spectators on the weekend of 8th – 9th October, with the eerily quiet 45-lap race zipping around a 1.8 km track in the heart of Central, starting at the Central Harbourfront, with the grandstand on Lung Wo Road, and including a 555-meter straightway and two sharp hairpin turns to add to the excitement. In the end, reigining Formula E champion Sebastien Buemi of Zwitzerland took first place for team Renault e.Dams, steadily and consistently gaining ground throughout the race and hanging onto his first-place spot for the entire latter third of the laps. The surprise second place win was Brazilian Lucas Di Grassi for Audi ABT-Schaeffler, crawling his way ahead 17 places, having started in the second-last place after a crash in the qualifiers. Veteran former Formula One driver Nick Heidfeld finished third, rounding out the podium positions. In total, 10 teams participated in the 1.8-km street circuit, to the excitement of an estimated 12,133 spectators watching from grandstands and giant screens in the event’s strategically-positioned ‘E Vilage’ sites. The appeal of the race reached Hongkongers and visitors of all ages and walks of life; it was exciting to see so many faces lit up by the excitement, and to know that the core values of the event are so well aligned with the type of future possible for Hong Kong, should we choose it. Formula E is based on a “3 E’ principle – Energy, Environment and Entertainment – designed to appeal to a fresh generation of motorsport fans and drive a new type of motorsport racing into the future. Many were skeptical of this huge new venture at the start, but the proof most certainly is in the pudding. 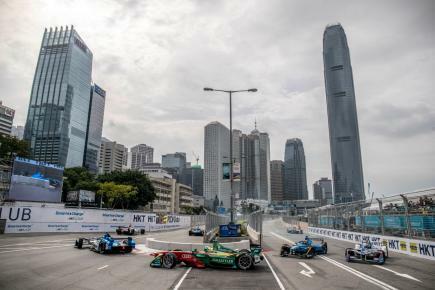 The warm reception in Hong Kong mirrors that of the other major cities that have hosted the event, and bodes well for the future of electric car racing, as well as raising the profile of electric driving overall. What sets the race apart? Ultimately, it’s all about the cars. Unlike regular motorsport racing, where the cars burn petrol, Formula E cars generate their own power from onboard batteries. And that’s not all. The event’s overall carbon footprint is a key concern to the organisers, so Formula E uses groundbreaking Aquafuel generators to charge the race cars. The futuristic generators run on a fuel that is virtually emission free – glycerine. Their use will ensure that all Formula E cars are charged quickly, safely and without producing CO2 emissions. With Formula E cars being electric, they are also super quiet; even at high speed the cars will be around 80 decibels, compare that to a traditional car which produces around 70 decibels when travelling at 70 miles per hour. It’s an eerily satisfying sensation to be standing right near a race track and being able to hear the commentator as the cars whiz past! For the Hong Kong Formula E, huge lithium ion batteries – each of which packs the same punch as 10,000 AA batteries – powered the cars. However, this isn’t enough power for the whole 45-lap race; instead, each driver must make a mandatory pit stop to change cars (!) halfway through, as it would take too long to swap batteries. Though it sounds odd at first, in fact this added a fascinating dimension to the race, as we watched each driver choose his strategy as to when to spend or save battery power, and at what point in the race to make the switch to their second vehicle – sometimes with just a drop of juice left in the battery, making for nail-biting suspense! The growth of Formula E has been audacious since the first season began in Beijing, in just 2014, with a nine-month season that ended with Brazilian driver Nelson Piquet Jr. making history as the first ever Formula E Champion, in London. For the 2016-17 season, the number of rounds has been increased to 14, with five new cities on the roster - Hong Kong, Marrakesh, Brussels, Montreal and New York. Meanwhile the organisers continue to innovate – and not just in the technology of the cars. In Hong Kong, spectators were able to get in on the action in a whole new way, literally giving a ‘push’ to their favourite driver, with an innovation called Fanboost: for each race, fans could vote their favourite driver via different social media outlets. The three most popular Fanboost drivers each receive an extra 30 kilowatts (roughly 40 brake horsepower), taking the power of the car from 200 bhp to 240 bhp. The power boost lasts for a total of five seconds, and is activated via a lever behind the steering wheel. The idea was a wild success; crowds whooped when the screens showed the chosen drivers using their fan-powered energy boosts. With all of this, the Formula E couldn’t come at a better time for Hong Kong. According to the Hong Kong Tourism Board, the total number of tourists declined by 2.5 per cent from 2014 to 2015. Although it is uncertain so far whether 2016 has managed to reverse this trend, a large-scale international event such as this can certainly help to tip the scales, not just for tourism, but for how the government views our potential for environmental leadership.